With thousands of hours of Micron pre-release validation, dozens of SSD qualification tests, and a heritage of award-winning SSDs, the Crucial BX500 has been thoroughly tried, tested, and proven. 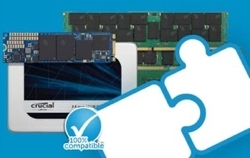 Installing a Crucial® SSD is easy! Nervous about installing an SSD? It’s easy and instantly makes your computer significantly faster! Anyone can do it – just follow along in our app! No computer skills are necessary. You don’t have to deal with a slow computer any more. Install an SSD – it’s easy! Here’s a quick look at how to do it. Warranty valid for three years from the original date of purchase or before writing the maximum total bytes written (TBW) as published in the product datasheet and as measured in the product’s SMART data, whichever comes first.